IK’s modelled bass instrument offers both realism and a fantastic degree of real-time control. Unless you plan to record a real bass, adding convincing bass guitar to your tracks can present a challenge. 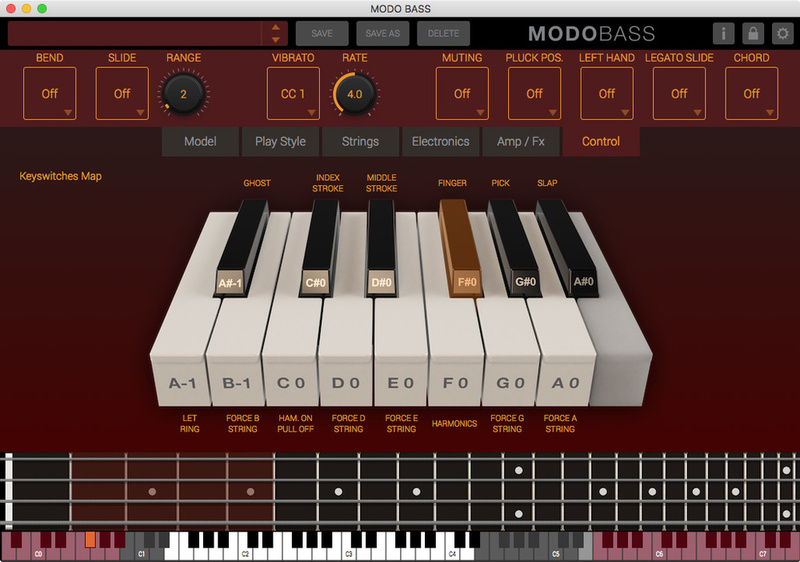 Your thoughts are most likely to turn to a decent sample-based virtual instrument, but Modo Bass might just have you thinking in a different direction. Apparently this instrument was eight years in development and was worked on in collaboration with a major university, the idea being to model not only a large number of classic basses but also to allow a realistic degree of interaction in the way the bass is played. Just like the real thing, the tone varies depending on whether you use your fingers or a pick and the sound also changes appropriately depending where you pluck the string relative to the bridge and how hard you pluck it. All the little organic noises produced by real basses are recreated, but placed under user control, and there are specific playing nuances that can be activated using keys (MIDI notes) outside the normal range of the instrument. Other variable controls may be assigned to MIDI controllers, but don’t respond to conventional DAW automation. 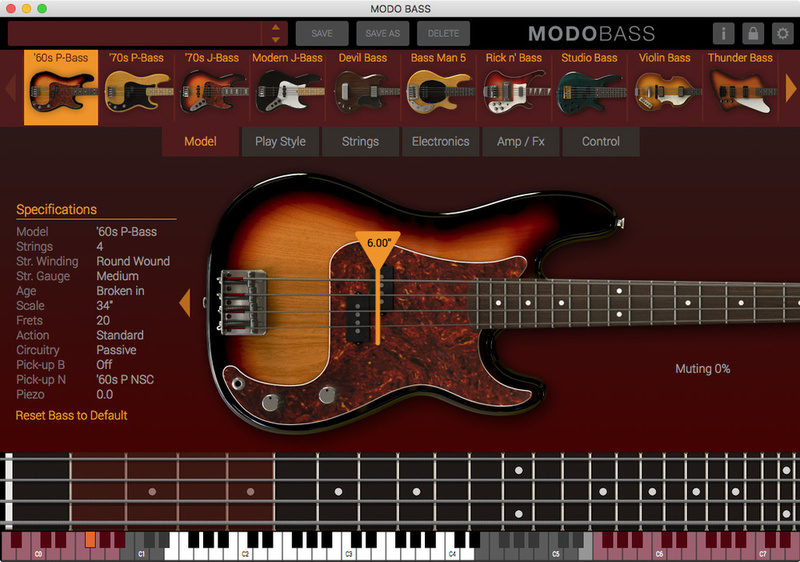 Modo Bass relies on modal synthesis technology, which is used to model each string as a nonlinear resonator that interacts in a realistic way with the action of the player as regards picking technique and string position. The GUI has tabs to change between the Model, Play Style, Strings, Electronics, Amp/FX and Control views. The Models view shows images of the 12 basses on offer, with the selected one shown in detail in the centre of the page. A keyboard and fingerboard view of the notes played runs along the bottom of the screen. Instruments range from the more obvious Fender, Music Man, Gibson and Rickenbacker basses right through to the Hofner ’Beatle’ violin bass via Ibanez and Warwick. In the Play Style view, graphical pads select finger, pick or slap and picking intensity where you can also mute strings by a variable degree and use the additional key control (seen in Control view) to produce bass harmonics, select from upstrokes, downstrokes or alternate picking, all switched using MIDI notes in the bottom octave of the keyboard. You can also force the bass to play specific sections only on a certain string, or add bends, slides and vibrato. Because each note is modelled in real time, each successive note is slightly different in character, just as it is with a real instrument. You can drag a ‘pick’ graphic over the image of the bass to select where to pick the string, choose what type of string is fitted (and even how broken in they are) and choose between four- and five-string bass options. You can even select a low or high action as that also changes the sustain and amount of string noise. One omission that struck me right away was that there was no fretless bass option. I would imagine this is very difficult to model accurately, but apparently it has already been added to the wish list for a future upgrade. The note range for each bass is the same as for the ‘real’ instrument. Once you get past the interaction of the player and the bass guitar, you can customise the electronics of the instrument; change pickups and their positions (maximum of two per instrument from a choice of 20 types), add under-bridge piezo pickups, add active electronics and adjust the virtual volume and tone controls. 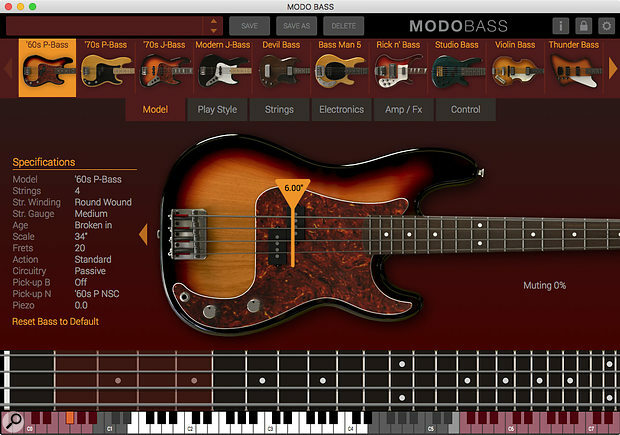 Modo Bass offers real-time control via the lower MIDI notes. When it comes to amplifiers and effects we’re back in more familiar territory, with seven stomp effects and a choice of two bass amps. The pedals comprise Octaver, Distortion, Chorus, Compressor, Delay, Envelope Filter and a Graphic EQ taken from the AmpliTube Custom Shop. The amp choice is a valve head and 1x15 cab that I suspect is modelled on an Ampeg or a solid-state model with a 4x10 cab for a more modern sound. What really sets Modo aside from sampled solutions, other than the ability to vary the sound so much, is the degree of control over how you interact with the bass in real time. Patch changing is also fast, as the memory footprint is much smaller than for a sample-based instrument. The ability to use assignable MIDI controllers for variable functions and the utilisation of the ‘out of range’ MIDI notes adds greatly to the realism of the performance. You can adjust things like the degree of string muting, or the length of time the strings ring for, add a slide, adjust vibrato and even tweak how much noise is generated when you take your finger off a string. And, as every note is modelled afresh, there’s an organic difference between successive notes that is tough to replicate with samples unless each note is sampled many times. The amount of detail you can apply if you deem fit is remarkable: you can switch between chord mode and note mode as you play, change the type of playing stroke and even change which fingers you are playing with. If you don’t feel dextrous enough to do this in real time, you can easily add it after recording the bass part, but in reality you don’t have to make that many tweaks to the performance for it to sound utterly convincing. Of course none of the above would matter a damn if the thing didn’t actually sound like a real bass guitar — but it does. If you just play the sounds as they come without using any of the real-time (or unreal if you do it later) controls to refine the playing nuances, it still sounds every bit as realistic as a sampled bass. The little string noises add to the realism, and if you want to change the fundamental sound of the bass by changing pickup type or position, you can do so in a way that is impossible to achieve using samples. Those two amp models also sound very convincing, offering vintage or modern sounds. My only minor criticism, other than the current lack of a fretless option, is that performance control is only possible via MIDI with no option to use DAW automation. This won’t be a problem for most users, especially given that many controller keyboards have controller knobs for this very purpose, and assigning the appropriate MIDI controller to a variable function is simple, but I’d have liked to have had the flexibility to work either way. 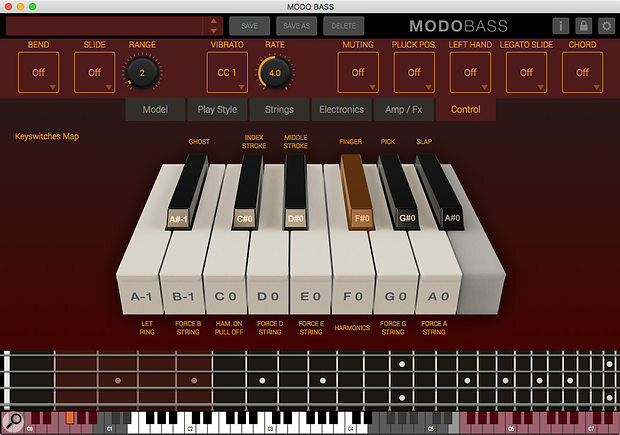 In all, Modo Bass is a remarkable piece of work and offers a far greater level of interaction and sound tailoring than any sample-based alternative I’ve tried to date. It took a lot of development and so isn’t cheap, but it is a seriously impressive alternative to a real bass guitar. The Spectrasonics Trilian sample-based instrument, though working on a different principle, still offers a great range of bass sounds, a useful degree of player interaction, and it includes fretless basses and double basses. Hugely versatile, both tonally and in terms of playing technique. The instruments can be customised. Excellent bass amp modelling included. No DAW automation, only MIDI control. This is the first time I’ve come across bass guitars modelled in such convincing detail. Whether you need this degree of control depends very much on the music you make, but what has been achieved here is most impressive. Download £299.99, boxed version £337.99. Crossgrades available from £199.99. Prices include VAT.